The majority of eCommerce sites will redirect you to the basket after you add a product. It is slowly but surely becoming an industry standard. 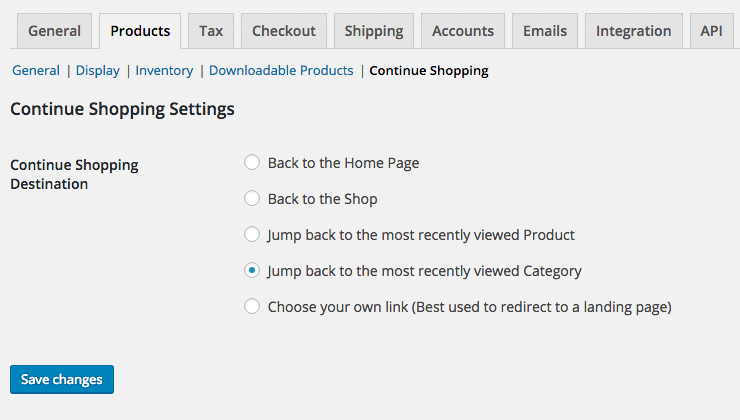 WooCommerce has a setting to allow you to do this on your own eCommerce site very easily. What is wrong with the Current Continue Shopping Button then? Well, as of the creation of this plugin, the WooCommerce Continue Shopping button always took the customer back to the homepage of your website. If you were predominantly a blog, with a small shop then this could cause confusion and would interrupt the shopping experience for the customer, which worst case scenario could result in cart abandonment. More recently however this will now default to taking the customer back to the shop page. This is a lot smoother and will work nicely. However what if you had multiple categories, or even a product with a large amount of Variations. If the customer wanted to buy a Medium T-Shirt in both Green and Blue then they would need to navigate through the categories again. Thankfully, there is a handy filter to allow you to easily change this link. Of course, if you are not a developer, or even if you are, plugins are always a great help. We manage multiple eCommerce sites and have come been asked on many occasions to change where the ‘Continue Shopping’ button went to; this has ranged from a ‘Current Sales’ landing page, to the most recently visited category. As such we created the Continue Shopping for WooCommerce plugin to easily and quickly change the destination. What exactly does this plugin do? Once you have downloaded and installed the Continue Shopping for WooCommerce plugin you will see a new WooCommerce settings page. From here you are given 5 choices, to go back to the original WooCommerce default and send the customer back to the home page or send them back to the shop. We have added three extra options, which are the most recently viewed Product, recently viewed Category and a custom link. The first 2 are fairly self explanatory. The latter allows you to send the customer to any link you want, this can be very handy if you like to emphasise landing pages, or even monthly/daily offers. As with the rest of our plugins, we will constantly be updating and improving this plugin too. For the next version we already have a couple of features planned. For instance when the Basket is empty you are greeted with ‘Your cart is currently empty.’ and a Return To Shop button. As with above there is a handy filter for this, although if you can wait we will be adding the ability to change this link with the next release. If you have used this plugin, or any of our other plugins we would love to hear your thoughts and feedback! Thanks for this plugin. It works very well and makes a webshop more customer friendly. However, there’s one function I really miss in order to improve the customer friendliness: if a customer updates the cart there should also be a ‘continue shopping’ button. This would make shopping very smooth! Thank you for your kinds comments. That is a nice idea actually, definitely something we will look to add into the next version release! I would like to install your awesome plugin Woocommerce continue shopping , but in my backend, there is a notice called Untested with your version of wordpress.I have the newest WordPress version. Is this plugin compatible with the newest version and also compatible with Themes like Flatsome. An do I have the choice to select go back to the last viewed product or last viewed category? Can you please tell me where exactly I have to paste that CSS Code in? And do I have to modify only that line: return http://www.yourwebsite.com/location? //return your desired link here. When I add an item directly from the categorypage it works fine. But if I have an item with variants or otherwise need to read more about the item before buying, the continue shopping button returns to the actual itempage and not the category.